Our Holidays this Year: Chop, Slice, Stir, Sip, Nibble, Cook, Eat, Relax. Repeat. Hope you all had a fantastic holiday! Over here in the DDD household, we’ve had a wonderful time the past few days, what with the HH on holidays between Christmas and New Year’s. After scrambling at a cougar’s pace (that would be the feline kind, not the Courtney-Cox kind) the last few weeks to complete my work at the college (ie, marking last-minute assignments and over 170 exams within the space of 4 days); keep up with writing commitments; and buy gifts for my loved ones (then wrap and give said gifts to their intended recipients)–on Christmas Eve, finally, I began to unwind, think about some serious chillaxing, and prepare for a fabulous festive feast (including triple alliteration, no less). This year, the HH announced once again that he would like a tradtional turkey dinner. As regular readers of this blog likely know, my honey is a devoted carnivore. Most days, this state of affairs presents no problem at all: we coexist peacefully; he eats his meat at lunch time, or orders off restaurant menus when we dine out; or he cooks his own steaks or hamburgers and consumes my dinner as his side dish. (For a good description of how another vegan-omni couple works it out in a similar way, see JL’s recent post). A huge turkey, however, is another matter entirely. One thing I love about the HH is his full acceptance of me–quirks, blemishes, and all, including aspects of myself that even I find difficult to tolerate. Neurotic tirades about germs, disease, airplanes, strange noises in the house at night, having to wash the dishes just so–et cetera–are all met with (mostly) patient, even responses or calm rebuttals. In the nearly-15 years we’ve been together, my sweetie has witnessed my physical proportions vacillate wildly a half dozen times, bouncing between an initially svelte, mini skirted physique to that of an engorged beach ball (nearly 200 pounds at the height of my candida woes in 2009). And not once–not even in a whisper–has he ever uttered a negative word about my weight, acted less affectionate, or suggested that I might like to go on a diet. And so, on Christmas Day, after sleeping in and chasing the lethargy with a shot of coffee (the HH) and matcha tea (moi), we opened our presents in front of the fireplace. And then the HH got to work cooking his turkey. After he popped it in the oven, he played sous-chef for me, chopping veggies, sautéing onions, slicing potatoes and trimming brussels sprouts. The rest of the day was spent alternately sipping warm apple cider drink (me, courtesy of Lexie). . . .
. . . or wine (he, courtesy of Casillero del Diablo). . .
. . . while reading (he: The Absolute Sound; she: The Blue Notebook and a few new cookbooks), playing with the Girls, doing the mega-crossword in The Globe and Mail (that’s a week-long project, I suspect) and listening to The Nutcracker, Buena Vista Social Club, Peggy Lee, Chopin and Zacharia. Throughout the day as we reclined and prepped, we snacked intermittently on this cranberry-crusted cashew goat-cheese log I’d made (simply whir about half of them in a blender to create a paste, then mix with the remaining whole berries and press the mess into your cheese; bake at 250F/120 C for 20 minutes to set). Heavenly! For dessert, I attempted my very first Sticky Toffee Pudding, combining recipes from both Angela and Lexie. The result was a thick, dense, spiced cake rendered gooey and sticky from soaking in toffee sauce, with a hefty scoop of Caramel Ice Cream alongside, also doused in more sauce (sorry, no photo–we lapped it up pretty quickly). While The HH loved the dessert, I would have been happier with just the ice cream and sauce. By this morning, I was ready to revert to lighter fare and more of my regular routine. Ever since you all weighed in on what you’d like to see here, I’ve also been thinking about quicker, easier dishes for the Flash in the Pan series of recipes. This breakfast is a hybrid of a classic chia pudding and a breakfast smoothie. It can be prepared the night before and left in the fridge to soften and plump up overnight. The pudding combines some of my favorite smoothie ingredients (rice protein powder, avocado, rice milk, cacao) with the texture of a pudding, resulting in a high-protein, high Omega-3 meal-in-a-bowl that provides a whole host of other health benefits as well. Pillowy soft, luxuriously creamy and rich tasting, this breakfast is a quick way to acquire a full serving of protein in what tastes like a dessert. It’s a great way to use up those ripe avocados on your countertop, too. I can’t think of a better way to cap off the holiday feasting. Can you? And finally. . . your opinion, please! I loved learning what you’d like to see on the blog in 2012 (and please feel free to keep those ideas coming in the comments!). For now, I’ve got a more immediate question for y’all (I already asked this one on Facebook, so if you answered there, thanks! ): The HH and I have been invited to the home of a friend of a friend for a New Year’s Eve bash. All I know about this gent is that he’s a true gourmet who loves to cook and eat. I’ve been asked to bring a sweet treat and am considering the following three (note that they’re not ACD friendly or gluten free–but then again, these are for a crowd of conventional eaters). or The elegant Matcha Chocolate Truffles? I’ll be back next time with some musings on the end of the year, resolutions and health in 2011! A great no-cook, prepare-ahead breakfast that you can pack up and bring to the office for those mornings you have no time for a nourishing meal as you rush out the door. It makes a great light lunch, too, alongside a crisp, fresh salad. Place everything but the chia seeds in a strong blender and blend until perfectly smooth. Pour into a container and stir in the chia seeds. Allow to sit for 5 minutes, then stir again to ensure that all the seeds are submerged. Cover and let sit in the refrigerator overnight. Stir again before serving. Makes 2 servings. Will keep, covered, in the refrigerator for up to 3 days. 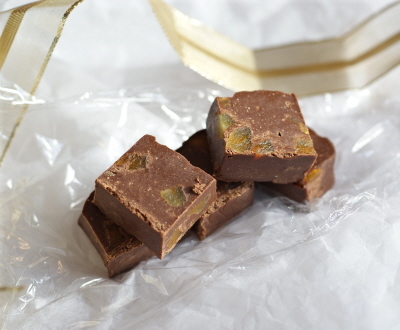 I’m sharing this recipe at Amy’s Slightly Indulgent Tuesday event. I’d go with the truffles – tres chic! And that breakfast looks YUM-o. Matcha! They look so elegant. Don and I work in the kitchen together on special dishes like the turkey dinners and the New Year’s stuffed cabbage (for good luck). Otherwise he usually cooks and I bake. I would go for the fudge but that is my sweet tooth talking. Both truffles are impressive. The matcha tea ones are the ones I vote most likely to wow a gourmet. Looks like your holiday was fabulous!! Oh, so relaxing! You just reminded me that I need to take a day off and do nothing. 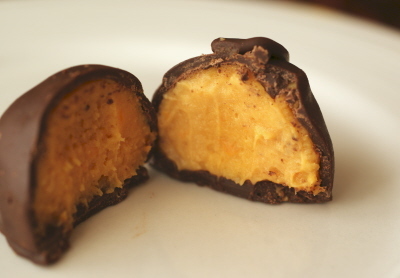 I vote sweet potato truffles! Yes, you DO!! 😉 Thanks, Alisa! Gracious, Ricki! What a lovely recap of the holiday, through photos and food. I’m drooling over just about everything, not least the heavenly chia pudding. This post warms my stomach and my heart! Delicious food (as ALWAYS) but it’s the glimpse into your relationship that is so special. I feel so lucky to have met you and your HH in person and your description of the love and respect you have for one another was obvious during our dinner with our omnivorous but super-supportive loves. Your dogs are so beautiful. One day when my children are older, I hope to have a dog to run and walk with. Dogs are so magical. So glad you liked the potatoes! What did you use in place of the wine – more broth?